We are delighted to welcome the Triskel Arts Centre to TAPSTAK! 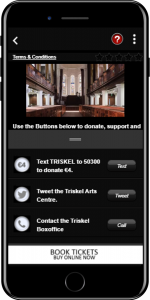 Contact, support or donate to the centre at the tap of a button with the new Triskel micro-app! The Arts Centre is a vibrant cultural HUB in the heart of Cork City celebrating 40 years in 2018. The main auditorium Triskel Christchurch is a multidisciplinary space housed in a fully refurbished neoclassical Georgian Church. Along with a rich bill of live music, focusing on Classical and Jazz concerts, cultural cinema, visual art exhibitions and literary events the centre offers a second contemporary art room Triskel Art Space. Scrypt Café Bar offers an atmospheric casual dining and coffee space with a great brunch and lunch menu and a tapas style evening venue. Donate to the Triskel Arts Centre by SMS. Tweet the @Triskel Arts Centre. Contact the Box-office by Phone.